Don't forget about the other Giveaways! Giveaway 7 is here and up for grabs! It comes from one of my favorite blogs, shops, person, April of Funky Vintage Lovely. April has a great blog as well as a fabulous shop. Here are some yummy goodies you'll find in her shop. I have a few different colors of these and wear them all the time. April has been gracious enough to give the winner a Keep Calm and Carry On ring and you can choose which color you would like. They are super cute right?! April is also offering a discount code for all of you! YEAH! Use the code: GLIMPSE10 at checkout to receive 10% off your order. But here's how you can win the ring. 1.) MANDATORY: Let me know which ring color you would choose if you won. 2.) Follow Funky Vintage Lovely the blog. 3.) Like Funky Vintage Lovely on Facebook. 4.) Follow Funky Vintage Lovely on Twitter. 5.) Follow A Glimpse Inside. 6.) Post the Celebration button (code in top, left column) on your blog. Leave me a link. 7.) Blog, Tweet, or FB about this giveaway. Leave me a link. Giveaway 8 will be up at 5 pm! I follow funky vintage on twitter!! Hard choice, but probably gray!! I'm a follower of Funky Vintage Lovely! I would pick the turquoise! LOVE IT! I'd pick the turquoise... so "happy"! I like both colors, but turquoise is the one I'd pick! I am already a follower of her blog! Love it! Of course I follow A Glimpse Inside! I NEED the turquoise ring!! I like funky vintage lovely on facebook too! Defintley the turquoise one! It's gorgeous! I'd go with the pretty, cool gray ring. So calming. I just love April's blog and shop! I would choose the gray ring. I'd pick the goes with anything grey. Thanks for hosting this giveaway! 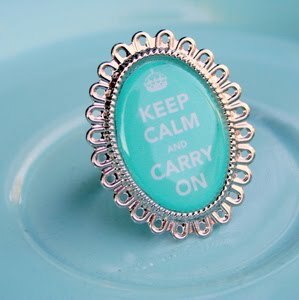 Love the Keep Calm Rings! Grey for me! Love both but I'm going with Turquoise. I would pick turquoise! Love it! I follow Funky Vintage Lovely. I follow FVL on Facebook. I love the purpley-gray one! I'd choose the Grey ring.